Background and Aims: The serine proteinase inhibitor alpha-1 anti-trypsin (AAT) protects the body against protease activity. Several functions of AAT beyond those attributed to its anti-protease activity have been described, among them immunomodulatory and anti-inflammatory properties. The present study aimed to determine the efficacy of AAT for the treatment of immune-mediated liver injury using the models of concanavalin A-induced immune-mediated hepatitis and acetaminophen -induced liver damage. Methods: AAT was administered to mice subjected to concanavalin A-induced immune-mediated hepatitis or 2 h after acetaminophen-induced liver damage. Mice were followed for changes in serum levels of liver enzymes, liver histology, and for interferon gamma serum levels. Results: Treatment with AAT alleviated concanavalin A-induced immune-mediated liver damage, as demonstrated by a reduction in the serum levels of liver enzymes and interferon gamma, and an improved lymphocyte infiltration into the liver on liver biopsies. Moreover, treatment with AAT was associated with alleviation of the acetaminophen-induced liver injury. Conclusions: AAT exerts an hepatoprotective effect on immune-mediated and drug-induced liver damage. The data support its potential use in patients with immune-associated liver disorders. The hepatoprotective role of AAT has been previously described. Systemic treatment with AAT decreased Jo2-induced liver cell apoptosis in the Jo2 FAS/CD95 activating liver failure model. Increased survival and a reduction of apoptotic hepatocytes were also observed in the alpha-amanitin and acetaminophen (APAP)-induced liver injury mouse models.11 The effect of A1AT therapy was determined in A1AT or A1AT plus oncostatin M treated primary human hepatocytes isolated from liver tissues obtained from A1AT-deficient patients. In a dose-dependent manner, purified A1AT lowered SERPINA1 expression in the hepatocytes. This latter effect was more prominent in hepatocytes stimulated with oncostatin M.
It has been suggested that augmentation with native M-A1AT protein and a parallel reduction in expression of dysfunctional mutant Z-A1AT may be beneficial for severe AAT-deficient liver, and this motivates further studies.12 The present study aimed to determine the potential efficacy of AAT for the treatment of immune-mediated liver injury using models of concanavalin A (ConA)-induced hepatitis and APAP-induced liver damage to determine its potential systemic immunomodulatory effect. Male C57BL/6 mice (11–12 weeks old) were obtained from Harlan Laboratories (Jerusalem, Israel) and maintained in the Animal Core of the Hadassah-Hebrew University Medical School. Mice received standard laboratory chow and water ad libitum and were housed in a 12-hour light/dark cycle. Animal experiments were performed according to the guidelines and with the approval of the Hebrew University-Hadassah Institutional Committee for Care and Use of Laboratory Animals. ConA (MP Biomedicals, Santa Ana, CA, USA) was dissolved in a solution consisting of 50 mM Tris pH 7, 150 mM NaCl, and 4 mM CaCl2, and was injected into the tail vein at a dose of 500 μg/mouse (15 mg/kg). Mice were sacrificed 15 h after ConA injection. Two consecutive experiments were conducted. In the first study, four groups of mice were used (n = 5/group). Mice in the control groups were treated with 0.35 mg/mouse double-distilled water or dexamethasone 2 h before ConA injection; the two AAT-treated groups (AAT A-9024; Sigma, St. Louis, MO, USA) were orally administered with 1.0 or 0.2 mg/mouse of AAT. In the second experiment, 5 groups (n = 6/group) were studied. Mice were treated with double-distilled water or with dexamethasone, or with one of three AAT dosages (0.35, 1.0 or 2.0 mg/mouse) administered intraperitoneally. APAP-mediated hepatotoxicity was induced in mice via oral administration of 4 mg of APAP. Liver toxicity was determined based on the serum alanine aminotransferase (ALT) and aspartate aminotransferase (AST) levels. Three groups of mice were used (n = 5/group). At 2 h after the oral administration of APAP, the mice were treated with double-distilled water or with one of two AAT dosages (25 or 0.5 mg/mouse) administered intraperitoneally. Liver enzymes. Serum was obtained from individual mice. Serum AST and ALT levels were determined using an automated analyzer. Cytokine measurement. Serum interferon-gamma (IFN-γ) levels were measured in each animal using a commercially available “sandwich” ELISA kit (Quantikine; R&D Systems, Minneapolis, MN, USA). Histological examination of the liver. Paraffin-embedded liver sections were prepared from each mouse. Organs were sliced into 4–5-μm-thick parts, and these sections were stained with hematoxylin-eosin. The sections were scored according to the extent of liver damage using a previously described method13,14 with the following parameters: lymphocyte adhesion to hepatic and portal veins and sinusoids, the number of infiltrating leukocytes into the liver parenchyma, and the number of necrotic lesions (all per 10X high-power field). The comparison of two independent groups’ means was performed using a two-sided student’s t-test. A p value of <0.05 was considered significant. The immunomodulatory effect of AAT was assessed in the ConA-induced hepatitis model via the measurement of liver enzymes and pathology. Fig. 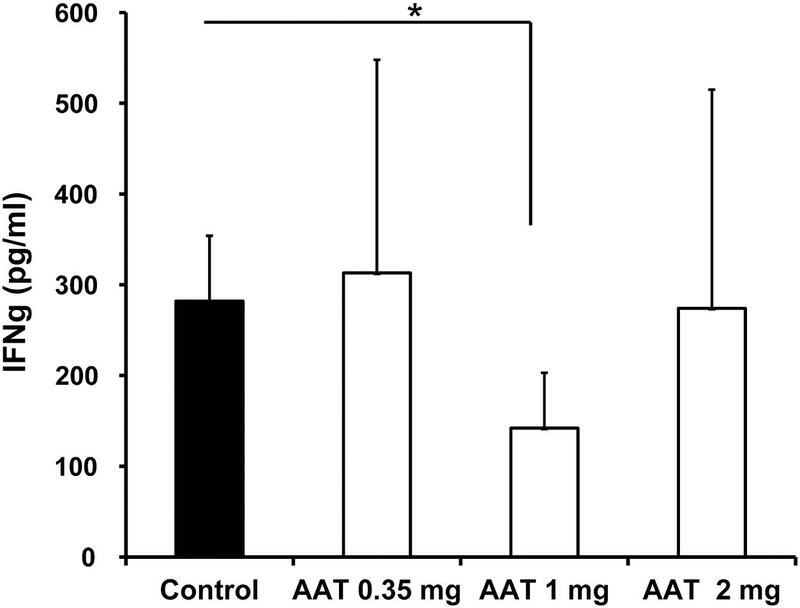 1 shows the impact of intraperitoneal administration of AAT on serum ALT levels (Fig. 1A). Intraperitoneal administration of AAT exerted a dose-dependent beneficial effect on liver damage. A trend for reduction in the liver enzymes was detected for the 0.35 mg and 1 mg treated groups but not for the 2 mg treated group. AST levels corresponded to the ALT levels (p = non-significant). Fig. 1. Effect of AAT on immune-mediated liver damage in the ConA-induced hepatitis model. A. Mice were treated intraperitonally with three dosages of AAT following ConA administration; after 15 h, serum ALT levels were measured. B. Percentage of mice developing the significant disease (ALT >1000 IU) was reduced in the mice treated with 0.35 mg AAT. Fig. 1B shows that the number of mice developing severe disease (ALT >1000 IU) was markedly reduced from 100% in the controls to 50% in the 1 mg parenteral AAT-treated groups (p < 0.005). No effect was noted in orally treated mice. Fig. 2 shows the effect of AAT on the serum IFNγ levels. A significant reduction in IFNγ serum levels was observed in mice treated with the intraperitoneal dose of 1.0 mg (p < 0.05), but not for those receiving the low (0.35 mg) or high (2.0 mg) dosages. Fig. 2. Effect of AAT on the inflammatory response in the ConA-induced hepatitis model. Serum IFNγ levels were measured via ELISA and were significantly reduced in the mice treated with 0.35 mg AAT. Table 1 shows the effect of the intraperitoneal administration of AAT on the histological score. The mice receiving an intraperitoneal dose of 0.35 mg of AAT exhibited a significant improvement in the histological score for infiltrating lymphocytes (p < 0.05). Fig. 3 shows representative sections from mice in the AAT-treated and saline-treated control groups, indicating a decrease in lymphocyte infiltration to the liver. Abbreviations: AAT, alpha-1 anti-trypsin; ConA, concanavalin A; IP, intraperitoneal. Fig. 3. Effect of AAT on histology in the ConA-induced hepatitis model. A. Saline-treated control mice displayed lymphocyte adhesion to veins and sinusoids, necrotic foci, and leukocyte infiltration into the parenchyma. B. AAT-treated mice displayed reduced leukocyte infiltration into the parenchyma. The hepatoprotective effect of AAT was tested in the APAP-mediated liver damage model. Mice were treated with one of two dosages of AAT at 2 h after the induction of injury. Fig. 4 shows that both the 0.25 mg and 0.5 mg dosages of AAT were associated with a trend for a decrease in the serum AST levels (p = non-significant). A similar trend on the serum ALT levels was observed (p = non-significant). Fig. 4. Effect of AAT on APAP-induced liver damage. 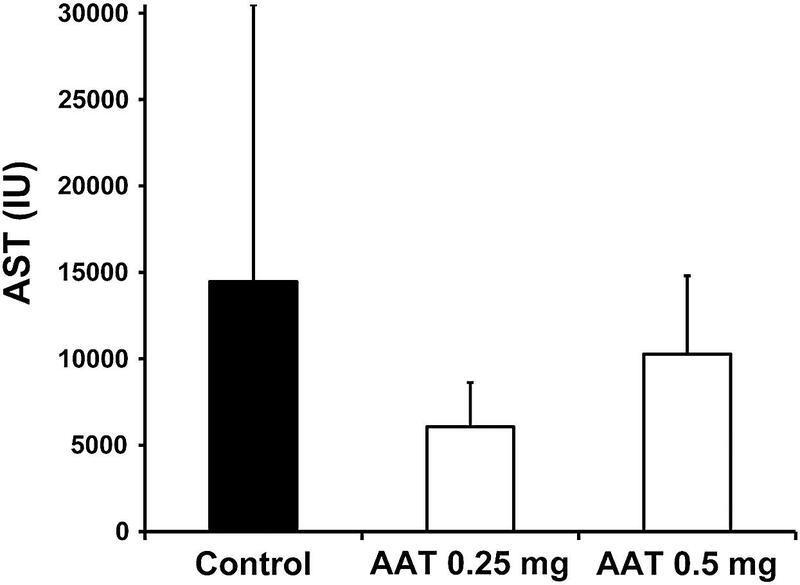 Mice were treated with three different intraperitoneal dosages of AAT at 2 h after APAP administration, followed by measurement of ALT serum levels. In the present study, intraperitoneal administration of AAT exerted a dose-dependent beneficial effect on the ConA immune-mediated hepatitis model, as demonstrated by a reduction in serum levels of liver enzymes and IFNγ. The number of mice developing severe disease was markedly reduced from 100% in controls to 50% in AAT-treated mice. Mice treated with the 0.35 mg intraperitoneal dose displayed a significant improvement in the histological score for infiltrating lymphocytes. As liver enzymes and IFNγ serum levels change over time in this model, following them along the experimental course may have shown better correlation. The lack of an observed effect of orally administered AAT may be attributed to the lack of its absorption or the lack of a result of AAT on the immune cells in the gut. Drug-induced liver injury (DILI) is a common cause for drug withdrawal from the market and can result in severe clinical outcomes.19 Idiosyncratic DILI development is mediated by multiple events, including reactive metabolite formation, oxidative stress, and signaling pathway inductions, and may involve innate and adaptive immune responses.20 Cytotoxic T lymphocytes were proposed to play an essential role in the pathogenesis of the liver damage mediated by several drugs.21 Immunomodulatory agents are being developed as potential treatments for NASH and DILI.22–27 APAP is a commonly used antipyretic and analgesic agent. APAP overdose and the resulting hepatotoxicity constitute a significant health problem. APAP overdose may lead to severe and even fatal hepatotoxicity.28 The APAP-mediated liver injury is characterized by high serum levels of liver enzymes and may invovle immune mediated injury.29 Our data suggest a potential for AAT to exert a hepatoprotective effect on the APAP-mediated liver damage model. Both the 0.25 mg and 0.5 mg dosages were associated with a trend for a decrease in the serum liver enzyme levels. The results of the present study support the hepatoprotective effect of AAT. Further studies are required to elucidate the mechanism of action in different models. In light of recent ongoing trials of AAT in patients with diabetes,37,38 and considering its high clinical safety record, the data of the present study suggest its potential use for liver disorders in which the immune system is involved in the pathogenesis of, including NASH, and for prevention or treatment of DILI. This work was supported in part by the Roaman-Epstein Research Foundation (to YI). Designed the study (YI, ABY), wrote the manuscript (YI, ABY, YS), conducted the experiments (ABY).